Usually in Epson Printers, there is a hidden Waste Ink Tank somewhere in the Printer's bottom. There is also a set of Waste Ink Pads to absorb Waste Ink. When the Ink Pads gets Saturated with Ink and can no longer take more ink. The printer's Software prompts the computer, to replace the Waste Ink Pads or call for the customer care technicians. Now this time around in Epson L 110 printer, there is no Waste Ink Tank, only a very big compartment full of Waste Ink Pads. Once the Waste Ink Pads are full, the printer would turn red lights on, give you many prompts to check the ink level and so on. I have successfully located the Waste Ink Pads and also arrived at a possible solution for the Waste Ink without the use of the waste Ink Pads. I just reverted to the idea of fixing a detachable Waste Ink Tank to the Waste Ink Output point. 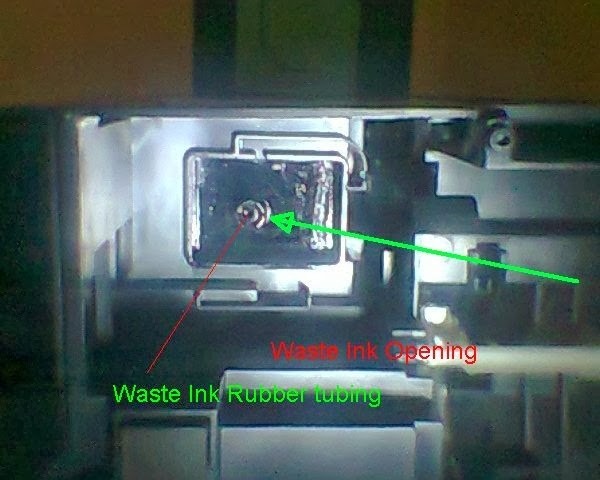 But the Epson Engineers did some quick thinking and made the Waste Ink Output tube very small in length, so that it cannot be pulled out to rejoin to another tube to make a Waste Ink Tank Possible. Caution, Warning, Please Do Not Pull Out the Waste Ink Output Tube, once it is visible to you. I have tried it many times, but it cannot be done with a forcep or any other instrument. Hence stop thinking of doing this. Now you have no other option left to attach the External Waste Ink Tank. But I have got an idea and i have tried and tested it also. It is working. But for this you will have to do some indegenious re - tooling work to make it a success. Just try to avoid the usual tendency of fitting a new tube to the Waste Ink Rubber Tubing. Instead the fix a bigger tubing to the Hard black plastic Waste Ink Opening, just shown above in green colour arrow. You have to use your own plastic container, which fixes correctly to the Hard black plastic Waste Ink Opening. Just use a used Mosquito Repellent bottle. Just like the below shown image. You can improvise. Just you have do some retooling, or widening or narrowing of the plastic bottle. 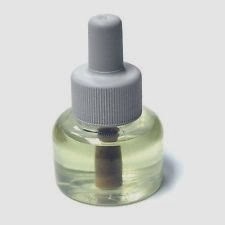 Just remove the cap, inside you will be having black rod, which diffuses the mosquito repellent fluid. Pull out the black rod. Now try to fit the bottle to the Hard black plastic Waste Ink Opening (not the white tubing). Personally, i have attached a squeezable plastic gum bottle. This is a just a gum bottle. 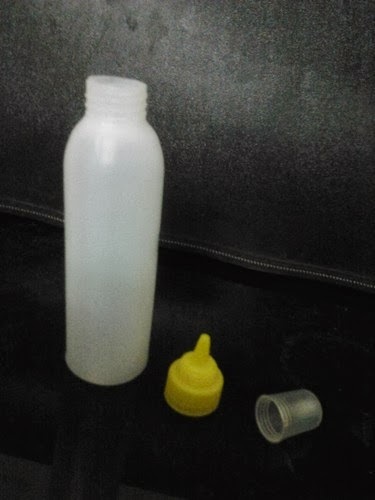 They fill synthetic gum in these bottles and sell for five rupees. i got a used bottle and then removed the top cover and the nozzle. Take the clear white bottle. Let the plastic cool for some time. Take a straight plastic connector used for a fish tanks. Insert the Straight plastic connector in to the recently created hole a the bottom of the white plastic bottle. Just put some quick fixing hard adhesive to the plastic connector and then connect it. So that there is no leak. Let it dry for a few minutes. Check for any leakage and then proceed to next step. Now just connect a white plastic fish tank aquarium tube to the outside of the straight plastic connector. Connect the Plastic bottle to the Hard black plastic Waste Ink Opening in Epson L 110 Printer and then let the tubing come down and put the tube in to a bigger plastic container externally. First i use a buffer tank, the buffer tank is attached to the printer, there is a hosing tube from the buffer tank to the bigger external tank. The ink could be drained periodically from bigger external tank. Whereas the buffer tank is always attached to the L 110 printer. There is no need to re attach the Waste Ink Pad Chamber, by using this method. Hello, I have been using this printer for more than a year already. And I noticed that my printer has became so slow in printing(one page of nothing but texts would take 3 minutes to print on a normal bond paper) Do you have any suggestions on how I can make it print faster? just while printing, make the setting plain paper, standard not high and not premium glossy or matte setting. If you make color settings as high, then it would become slow, as the printer is only doing its duty of obeying its master's setting preferences. will you pls help me with my epson l110 printer? it has no sign of black ink after nozzle check and ive tried several head cleans but nothings happening..my tank are all full..
switch the printer on. then give a test page. If still the black ink does not flow, then detach the ink tank. Now lift the tank up to the maximum, without hurting the ink tubes. Now due to siphoning effect the ink will enter the ink cartridge at a rapid phase. Even clogged heads, now will leak ink. Just try to remove excess ink by doing several head cleans, then the clogged head is unclogged. Now you black ink will be fine. You will start printing again. Always, my advice try to print a few page every couple of days, so that there is no drying of ink. Thanks for posting this blog. This blog is helpful for viewers.